Prime, Inc. and Nussbaum Transportation were named the overall Best Fleets to Drive For by the Truckload Carriers Association and CarriersEdge Monday at TCA’s 2019 Annual Convention in Las Vegas. Nussbaum, based in Hudson, Illinois won in the small fleet category. The carrier operates 400 trucks. TCA said the carrier’s driver scorecard and mobile app, as well as a career path and driver certification program, propelled Nussbaum to the award. The small fleet category is sponsored by DMC Insurance. The Springfield, Missouri-based Prime, Inc., won in the large fleet category. The carrier operates upwards of 7,000 power units. TCA attributed its win to the carrier’s committees, social groups and educational opportunities that contribute to personal and professional development for its drivers. The large fleet category is sponsored by EpicVue. Now in its 11th year, the Best Fleets contest is based on driver surveys and interviews conducted by CarriersEdge and seeks to recognize for-hire trucking companies that provide the best workplace experience for drivers. Fleets must be nominated by either a company driver or independent contractor, and then nominees are evaluated based on a range of categories. Fenton based trucking and logistics company launches innovative driver pay program in an effort to recruit new drivers that provides guaranteed compensation exceeding $100,000 a year for solo Drivers and $250,000 for teams regardless of miles driven. ST. LOUIS, March 13, 2019 /PRNewswire/ -- Mid America Logistics, one of the fastest growing technology-enabled logistics and trucking companies in North America, has announced a new driver program called 'No More Counting Miles' as a transparent driver pay model. The program allows single or team Drivers to choose 30, 60, or 90 day tours and provide guaranteed compensation that escalates based on length of the tour. Drivers have control of their start date of each tour and are not obligated to start another tour until they contractually commit to another tour. Mid America Logistics' Managing Partner and co-founder, Sam Baisch, stated, "The biggest pain point in the trucking industry is staying competitive against over 500,000 registered trucking companies in the US. Our Logistics division has found new innovative ways to over double in size and we used that innovation to create a market disrupter for our trucking division." Baisch continued, "In creating this program we addressed the two greatest irritants of drivers; driver payroll and control of their personal time. This gives the control back in the drivers hands." Under Mid America Logistics' new program, Solo Drivers are compensated a fixed gross amount of either $6,500, $14,000, and $24,000 for 30, 60, and 90 day tours respectively. Team drivers are compensated $17,000, $38,000 and $63,000 for the same respective tour periods. Drivers are contracted on tours independently and entitled to the published amounts and paid weekly. They are provided paid orientation for their first tour and issued a late model Freightliner Cascadia Tractor and trailer. If a Driver wishes to continue driving for Mid America Logistics, they simply contract for an additional tour period. Mid America will entertain drivers under this program with a minimum of two years of long haul driving experience and a clean driving and criminal record. "Oftentimes drivers are lured away based on a promise of making six figures a year and never get the miles to do so," said Ann Searles the Asset Operations Manager of Mid America Logistics. "Now we have the ability to provide a fixed model that is transparent where we pay drivers for their time while respecting their family lives". Mid America Logistics is the fastest growing transportation firm based in the Gateway Region. With offices in St. Louis, Charlotte, Cincinnati, Jacksonville, Nashville, Phoenix, Northwest Arkansas and Guadalajara, Mexico, Mid America has made its mark in the fields of trucking, logistics and technology. Employing over 130 employees across seven states, the company offers full truckload, less-than-truckload, and transportation technology services to clients in the food production, retail, CPG, industrial, and agricultural industries. The company has been recognized as a Top Workplace by the St. Louis Post Dispatch and as one of the fastest growing private companies in the the St. Louis Business Journal. The 32,000 pounds of explosives on the back of a truck headed east that crashed Friday evening near the Idaho state border did not pose a risk of igniting when the highway was closed, the Idaho State Police said Monday. The single-truck crash closed four miles of Interstate 90 after 7 p.m. Friday for nearly three hours. The ISP reported Saturday that the truck’s cargo were missiles, but clarified Monday that the devices were more specifically described as “bombs” because they did not contain fuses. “We would have responded the same whether they were bombs or missiles,” said ISP Capt. John Kempf. The ISP reported the truck’s driver, 56-year-old Leiloni Dearanger, was uninjured after his truck drove in a snow bank at the Huetter rest area. A team of ordnance specialists from Fairchild Air Force Base assisted with the investigation. Kempf said the load originated in Washington and was headed to Indiana. Dearanger was cited for inattentive driving and allowed to continue driving, said Kempf. “These types of loads are not that uncommon,” he said. SPRINGFIELD -- A group called "Black Smoke Matters -- Missouri" is set to make a statement on I-44 on March 27. A peaceful protest is scheduled later this month in the trucking industry that dozens of drivers are expected to participate in as a response to what they call the "over regulation" of the trucking industry. Bill Bogar, who is heading up this protest from a group called "Black Smoke Matters Missouri" on march 27th, says a group of truckers will start in Joplin and do a slow roll east on I-44. Drivers will be going about 45 miles per hour in the right lane until they get to Strafford, then turn around and go back. Bogar says that there are quite a few issues drivers have with today's industry standards that they would like to see changed. Specifically, devices that are in almost every truck called ELD's, or electronic logging devices. They keep track of hours of service, speed, and location. Bogar believes they are a distraction, as he says they cause many drivers to try and race against the clock to avoid penalties. "If you're an owner-operator, and you're facing something that held you up, you're facing up to a 500-600 dollar fine now. That's basically your profit on the load. Now you're racing that GPS and your racing your E-log as well. It's a dangerous situation. It's distracted driving at it's finest," says Bogar. KOLR10 spoke to the Director of Safety at Prime Trucking, Steve Field. He says they back electronic logs, but he acknowledges that the industry standards should be changed when it comes to hours of service. "They can be detrimental. It tells the driver when to drive, and it tells them when to stop without taking into account how the driver truly feels. Is he tired, is he rested? But before we can make meaningful changes to the hours of service, we need to have good accurate data of what drivers are doing, and that's what electronic logs will do." While BSM Misosuri hopes to call attention to those issues they have, they also are doing this as a precursor to part of a bigger nationwide protest on April 12. Bogar estimates around 30,000 drivers nationwide will participate in a one-day strike, which he says will have big ramifications to companies across the country. Nearly 4,000 Mack trucks are being recalled, according to the National Highway Traffic Safety Administration. The recall affects about 3,906 model year 2019-2020 Mack Anthem, Granite and Pinnacle trucks manufactured between Jan. 15, 2018, and Jan. 11, of this year over an issue with the passenger side door down-view mirror. The company says the mirror could detach from the door. Mack will notify owners of affected trucks and replace the mirrors for free. Owners can contact Mack customer service at 1-800-866-1177 with recall number SC0416. NHTSA’s recall number is 19V-054. A Westmoreland County trucking terminal shuttered for good over the weekend, laying off about 100 workers — a casualty ahead of a planned liquidation by a New Jersey-based trucking company owned by Paul McCartney’s father-in-law. New England Motor Freight Inc. filed for Chapter 11 bankruptcy on Feb. 11, and it began to close its terminals and lay off workers throughout the Northeast. The company, based in Elizabeth, N.J., operates 39 trucking terminals in 16 states — including three in Pennsylvania. According to a layoff notice filed with the Pennsylvania Department of Labor and Industry, the company planned to shutter its Westmoreland County terminal, near Route 30 in North Huntingdon, along with terminals in Cumberland and Carbon counties. The three facilities employed a total of 450 people, according to the notice. The facilities began layoffs Feb. 15 and ceased operations on March 1. The company was founded in 1977 by Myron Shevell, whose daughter, Nancy Shevell, married Mr. McCartney in 2011. The former Beatle visited the company’s terminal in Cicero, N.Y., in 2012, according to a report from Syracuse.com. The company’s website credits Mr. Shevell for growing the company from 55 units and five terminals in the 1970s to more than 10,000 pieces of equipment and 40 terminals throughout the Northeast, Midwest and Puerto Rico. The website said the company had about 4,000 employees. Companies normally file for Chapter 11 bankruptcy to protect operations from creditors while reorganizing finances. But New England Motor Freight said it planned to use the proceedings “to facilitate an orderly wind-down of its operations,” according to a statement announcing the bankruptcy filing. “Upon the recommendation of its advisers, the company has determined that a Chapter 11 proceeding is the best mechanism to maximize the value of its assets for the benefit of its employees and various creditor constituencies,” the company stated. The bankruptcy filing estimated assets at $100 million to $500 million and liabilities at $50 million to $100 million. The filing listed 200 to 999 creditors. Vincent Colistra, a senior managing director with Phoenix Management Services and chief restructuring officer for the company, blamed industry trends for the company’s financial situation. “We have worked hard to explore options for New England Motor Freight, but the macro-economic factors confronting this industry are significant,” he stated. Mr. Colistra did not immediately return a request for comment. Unsuspecting truck drivers are receiving large fines at a bridge in the western suburbs. Some drivers said the signage is to blame. Drivers approach the intersection at the West 21st Street bridge over Addison Creek only to find a warning sign about a 12-ton weight limit when it is too late to turn around. In October, Zdravko Mihelcic drove right on 19th Avenue where the weight limit sign is facing the opposite direction, so he never saw it. The only other warning is on the bridge itself. Mihelcica said he was caught by Broadview police and was fined more than $3,300. Two other drivers were given fines as high as $14,000. JB Hunt driver Basheer Alqudah said his was fined more than $4,400. These drivers are not alone. According to police records obtained by CBS 2, more than 80 drivers were pulled over for overweight violations on and around the bridge over the last three years. CBS 2 noted several discrepancies with state and federal guidelines, which require the signs to be within 500 feet, but no closer than 50 feet, away from the structure. Mihelcic noted that they also have to be posted at least seven feet above the ground. “I’m 6’2? so this is 3 and a half feet from the sidewalk,” he said. Broadview Police declined a request for an on-camera interview, but told CBS 2 off camera that this is the first they’ve heard about the signage complaints. Police said they’re going to send officers out to investigate the allegations and will reach out to IDOT about any discrepancies. Meanwhile, Mihelcic said he feels like the issue is less about safety and more about business. Trucking is a misunderstood career; many people assume that truck drivers are underpaid, have inflexible work hours and little job security. While there are certainly some drawbacks to trucking, as with any job, there are plenty of great things about it as well. The starting salary for a truck driver is just under $40,000, with the potential to earn more as you gain experience. If you’re interested in trucking company jobs in Charlotte NC, you will have to get a CDL; depending on what you’d like to learn and what class of license you get, this costs between $3,000 to $7,000. Some companies will pay for your certification if you agree to work for them for a set amount of time. While many people have a hard time dredging up the funds for a vacation to see even some of the nation’s most famous sites, truckers are paid to travel. They get to see beautiful scenery across the nation—all while putting money into their bank accounts. It is true that trucking can get lonely and often means days or weeks spent away from family; however, truckers are able to control their schedules a lot more than your average office worker. You can determine what types of loads to take and whether you want to take more local, regional or national routes. This means that you can fit your schedule to your lifestyle—traveling far and wide or sticking close to home. Planned wisely, you can spend plenty of time with family. You may even be able to spend most nights and weekends at home. Some people seem to assume that trucking offers little benefits, but this is not true. While the specifics depend on the company, trucking comes with benefits—just like any full-time job. Some companies will even offer bonuses to their drivers for things like safe driving, good fuel economy and staying with the company for a long time. If you keep your license active and obey the laws, trucking comes with great job security. This is even more true now—there is a trucker shortage, which both increases job security and is driving wages up. Without college loans weighing them down, the pay and demand for workers actually gives truckers an advantage over college graduates. No job is perfect, but contrary to popular belief, truckers enjoy a range of benefits—right down to the perks of travel. A new service partnership between Navistar and Love’s Travel Stops will add more than 315 Love’s Truck Tire Care and Speedco locations and 1,000-plus technicians to the International truck service network. The partnership is expected to be fully operational by the second half of this year, according to a statement from the two companies. The partnership authorizes Love’s and Speedco locations to handle a range of new, extended and used truck warranty work and to perform warranty service with repair times of three hours or less on all International Class 6 through 8 trucks. Love’s locations will also accept Fleet Charge cards, guaranteeing Navistar customers get consistent nationwide parts pricing. The partnership between Navistar and Love’s creates the largest service footprint in the commercial transportation industry, according to the two companies. It brings the International service network to more than 1,000 locations in North America. Troopers say that they are enforcing "Jessica's Law," which requires drivers to remove all snow from their vehicles before they begin driving. 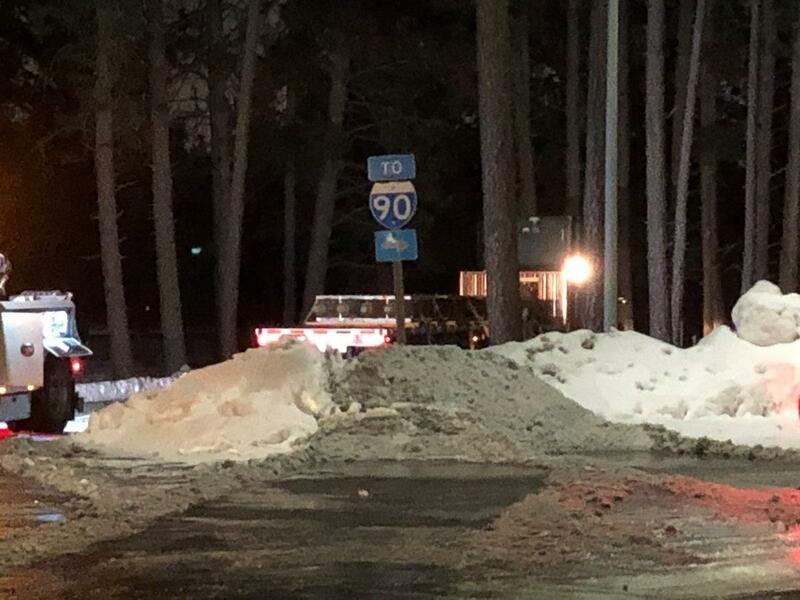 New Hampshire State Police conducted a snow removal detail on a major interstate during which they required truckers to climb on top of their vehicles to shovel. Following a weekend winter storm, troopers with the New Hampshire State Police conducted a vehicle snow removal detail on the morning of Monday, March 4, in Windham, according to WMUR. In photos and video captured during the enforcement detail and shared on social media, you can see multiple truck drivers standing on top of their trailers shoveling snow as troopers look on. The Pennsylvania Turnpike Commission admits that they may face bankruptcy if they lose a lawsuit filed by trucking groups. The Pennsylvania Turnpike Commission is billions of dollars in debt, seriously behind on payments to the state, facing a major lawsuit from trucking groups, and eyeing the possibility of bankruptcy, according to new reports. Several news outlets are reporting that the Pennsylvania Turnpike Commission is now $11 billion in debt in spite of the fact that they have raised tolls by 200% over the past 10 years. The debt is so massive that officials say that they will need to raise tolls on the Pennsylvania Turnpike every year until 2044 to pay it off. This flood of new reports of bad news for the Pennsylvania Turnpike Commission come after State Transportation Secretary Leslie Richards testified before the House Appropriations Committee during a budget hearing on February 26. Richards also serves as chair on the Pennsylvania Turnpike Commission. A lawsuit filed last year by the Owner-Operator Independent Drivers Association (OOIDA) and the National Motorists Association could put even more financial pressure on the Pennsylvania Turnpike Commission. The lawsuit argues that the turnpike tolls are too high and place an unreasonable burden on truck drivers. The suit also accuses the Pennsylvania Turnpike Commission of breaking federal law by using revenue generated from tolls for projects that are not Turnpike-related. The lawsuit is calling for the Pennsylvania Turnpike Commission to refund $6 billion in toll revenue paid since 2007. During the budget hearing, lawmakers asked Richards about what would happen if the truckers won the lawsuit. “We have to start talking about what that would mean. It would be catastrophic to have to pay back $6 billion dollars right away,” Richards replied. If the lawsuit is not settled by July, Pennsylvania may have to dramatically reduce funding for Amtrak and put the brakes on several planned construction projects.